If you aren’t making the most out of your phone or tablet then you are falling behind the new industry standards. You need to harness the power of today’s smartphone processors, connectivity capabilities, and clever transformations by utilising all the apps that are useful for architects. If you don’t, you are likely throwing away hours per week. The right apps can boost your productivity by more than 200%, giving you more time to spend where you need it most. Here are the best Apps for architects in 2017. We have done the heavy lifting for you: we have tested lots of apps for architects and we analysed the reviews. Architects that take advantage of using these apps gain an edge on their peers by being smarter instead of working harder. 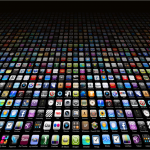 Get the most out of your day by employing the full arsenal of apps available on the market. Start building your personalised pocket toolkit today! Don’t want to read the whole article? Here are is a summary in table format. 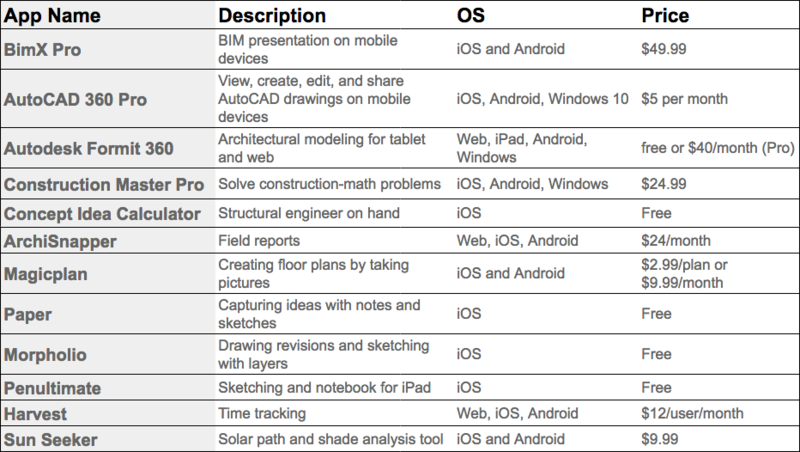 Best For: BIM presentation on mobile devices. If you’re using ArchiCAD, then you will want to consider purchasing BIMx PRO from Graphisoft, the ideal app for architects to present or share designs with clients and contractors. The app gives full control of your BIM projects with a cloud interface for working on site. 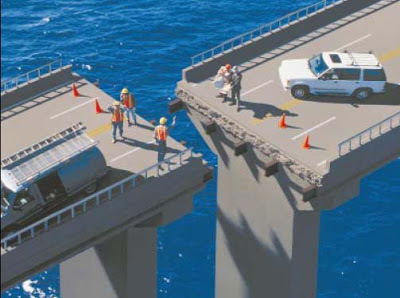 BIMx PRO helps bridge the gap between the design studio and the construction site. Share facilities so that you can easily share designs with clients or other stakeholders after they download the free version of the app, BIMx. Best For: view, create, edit, and share AutoCAD drawings on mobile devices. AutoCAD 360 Pro is a drawing and drafting app that enables you to view, create, edit, and share AutoCAD drawings on mobile devices. It is the natural extension to your AutoCAD desktop that lets you share plans across your desktop, mobile and web, all in the DWG format. Forget bringing drawings to site using this powerful app. Draft, edit, mark-up, and measure plans at the job site or on the go. Get updated drawings in AutoCAD when you get back to the office. Cost: free or $40 per month for Pro version with the Windows app, collaboration, and analysis features. FormIt is a part of the AutoDesk Revit software package. With FormIt 360 architectural modeling software, architects can sketch, collaborate, analyze, and revise early-stage design concepts from a tablet or online. Import real-world site information such as satellite images to create 3D building design concepts on the go. Select from a gallery of shapes, and use gestures to directly manipulate forms and change the model. Installing a calculator App on your mobile saves you from lugging around a physical calculator. Calculated Industries is the leading manufacturer of calculators for the building and construction industry and they have turned their popular physical calculators into mobile apps. Solve tough construction-math problems on the jobsite or in the office and reduce costly errors and save time and money with the Construction Master Pro. CM Pro can help users do almost everything, from laying out stairs to figuring out how much drywall to use. Concept allows you to determine basic dimensions and test the feasibility of using various materials in a project. Concept gives architects the tools to visualize their ideas before putting pencil to paper. It’s a pocket calculator which uses typical span-to-depth ratios for common steel, concrete and wood members, and gives you a quick overview of what dimensions a certain structural idea will require. As such it allows architects to explore the aesthetics of wood, concrete and steel and determine each material’s feasibility and depth. Test the viability of a desired material and roughly determine beam, slab and joist depth with an easy-to-use calculator. Share best results with clients and co-workers. Creating field reports from site visits can be a long and tedious process. 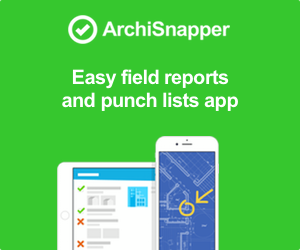 ArchiSnapper is a simple tool that helps you with this: use the App (available on iOS and Android) to draft reports with observations, photos, annotations, assignees, … After syncing the reports are available from the cloud account (on your desktop) for further editing and distribution. No more struggling with Word to draft field reports. Over 8 million downloads can’t be wrong. MagicPlan from Sensopia is the room scanning app that uses input from either your smartphone or tablet to devise complete floor plans. Use the app to shoot pictures of the corners of the room which is then turned into measurements and can be fine-tuned in the 2D overview. Scan multiple rooms to complete floor plans of entire buildings, and add furniture from their library if desired. This app will take a bit of practice to get the hang of, but once you’re familiar with how it works it is an indispensable tool. Paper, an iOS-only sketching app, enables users to draw, paint, colour and capture ideas on virtual sketchbooks before they have a chance to escape. It uses a custom “Ink Engine” that simulates real ink on real paper. Details like water color bleed and pencil texture are plainly visible. The developer, FiftyThree, has also created Pencil, a high-end stylus that WIRED asserts is superior to Apple’s own writing implement. Morpholio Trace Pro is a great sketching app for architects. Used with an iPad or iPad Pro and stylus, this app is the perfect extension of traditional drawing and sketching methods. It allows users to instantly draw on top of imported images, or background templates, layering comments or ideas to generate immediate sketches that are easy to circulate. Based on the reviews it’s clear that users really love this App. Create designs with color, templates, styles and layers. The app even has the loving touch of the Canary Yellow trace paper background. Cost: Free for essential features. Plus or Premium account for more advanced features. Penultimate is a very simple app that replaces your notebook, sketchbook and scratch paper all in one simple package. Users can have a separate notebook for each subject or project and the app supports embedded pictures. Everything you create in the app is synched to your Evernote account automatically so you can view, search and share them across a range of devices. This app gives you the ease and comfort of writing on paper, with the search functions and share-ability of digital. Harvest is a great and easy to use tool for time tracking and invoicing. As most of the apps in this list this is not only an App, but the combination of a web based cloud account in combination with an App component. Simple and quick time entry means there’s no excuse not to track and you’ll have the data you need to for billing and budgeting. Simplicity: There are a lot of time tracking Apps out there but we believe for a time tracking App to work well it has to be super easy to use and Harvest is one of the best when it comes down to ease of use. Alerts to notify when you’ve reached a percentage of the project budget. Integrations: There are add-ons that allow exchange of information to and from other digital services like Google Apps, Basecamp, QuickBooks, Asana and many more. No limits: Unlimited invoices, projects and clients. The Sun Seeker app features a virtual compass that helps architects identify the sun’s position, angle and path during the day (during Summers and Winters). Sun Seeker uses a highly interactive augmented 3D view which allows you to instantly determine the amount of sunlight your building will be receiving. Architects can gather data on the summer and winter solstice paths, sunrise and sunset times. This can be very helpful for architects to determine the direction of various areas and buildings and also can be helpful in creating and designing structures that allow more natural light to pass through them. And that’s it folks. Don’t only just use your phone for taking funny pictures of your cat hunting your socks, make it your powerful ally for work too. Also don’t forget to compliment your full suite of architecture apps with important day to day tools like, Google Drive or Dropbox for cloud storage, Asana or Toggl for team-based and personal task and time tracking, FreshBooks for invoicing and Trello for todo’s. And last but not leasts: for architects, contractors and construction engineers, who are often on the road WAZE (https://www.waze.com) with a data connection (to avoid traffic) is a must have. Waze uses user feedback (like mentions of traffic jams, police locations and road blocks) in order to get better routes for your next trip. If you spend a lot of time in the car, this App will save you lots of hours!